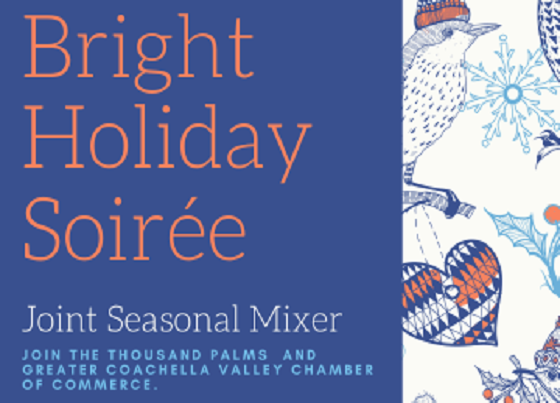 Join the largest chamber networking series in the valley as the Greater Coachella Valley Chamber of Commerce hosts its Joint Seasonal Mixer with the Thousand Palms Chamber of Commerce. This month’s event will be held on Tuesday, December 4th, at Bright Event Rentals beginning at 5:00 PM. Attendees are encouraged to bring plenty of business cards for networking. GCVCC Regional Mixers draw Chamber members and potential members from across the Coachella Valley, regularly hosting more than a hundred professionals from a variety of industries. This fun event features local fare from our host venue, a raffle contest and more! Our December Joint Seasonal Mixer is located at 72009 Metroplex Dr., Thousand Palms. Admission is free with toy donation for members and potential members. These events generally run 1.5 to 2 hours. For additional information contact the Chamber at 760.347.0676. Thank you to our generous sponsors, East Valley Coalition, Desert Care Network, Desert Urgent Care, and Greater Palm Springs CVB.